This chapter examines vertical transport of heat, moisture, momentum, trace gases, and aerosols, including the role of tropical deep convection and turbulence. Diurnal and seasonal variations in surface fluxes and boundary layer depth are examined. The boundary layer is compared over the ocean, humid, and dry tropics, including its role in dispersing chemicals and aerosols. Boundary layer clouds are examined in terms of their connection to sub-cloud layer properties. Comparisons are made between heat and moisture transport under a variety of convective modes such as mesoscale convective systems and shallow convection. The trade wind inversion, its maintenance, and east-west structure are presented. 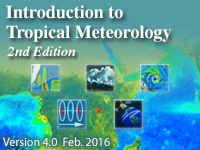 The final sections focus on how the tropical sub-cloud layer, clouds, and transport processes are represented in numerical models. this is on the job training for me, as well as educational. The lesson was detailed and had good explanations, but I had to refer to outside sources for clarity on some of the topics. The lesson was far longer than I expected based on the 1.25 hour rating. I expect to spend longer on the lesson than this rating, but this required several hours of my time. I also found this chapter to be by far the most difficult one I have studied so far. Define the Bowen ratio and explain how it is related to climate. Explain the impacts of vegetation removal on vertical transport and climate. Understand the importance of the mixed layer in meteorology and climate. Compare and contrast the convective and stable boundary layers, including their evolution during the diurnal cycle and impact on vertical transport. Describe the development of the nocturnal low-level jet. Compare and contrast properties of the mixed layer over ocean and land. Compare and contrast the mixed layer in the dry and humid tropics. Describe the transport of energy and momentum fluxes in the mixed layer. Describe the mechanisms responsible for the formation of the trade wind inversion (TWI). Recall and explain the geographic variations in mean TWI structure and its relationship with the tropical marine cloud distribution. For boundary layer clouds, recall difference in organization and structure based on sub-cloud properties and distance from shore. Describe the processes that contribute to the growth of tropical cumulus. Compare and contrast vertical transport in shallow cumulus, deep convection, and mesoscale stratiform clouds. Understand that in the tropics, most surface to tropopause transport occurs in mesoscale and synoptic systems. Describe how trace gases and aerosols are transported by tropical clouds. Compare and contrast the disturbed and undisturbed structure of the cloud and mixed layers. Understand the basics of how the tropical sub-cloud and cloud layers are represented in numerical models.